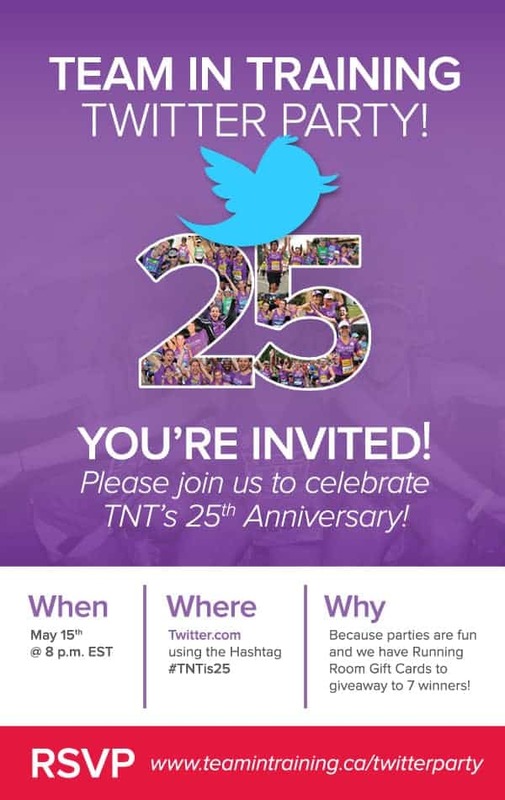 Join the Team in Training Canada Twitter Party on May 15th at 8 pm ET for their 25th anniversary celebration! Team in Training Canada is pretty amazing. It’s a site that helps you get active and stay in shape, travel to different places for runs and help raise money for blood cancers like Leukemia. You receive training and support from their huge network of certified coaches as well as meet other like-minded individuals who are on the path to fitness too! At the same time, you are helping to raise money towards cures for cancer. Did you know that every 33 minutes a Canadian is diagnosed with blood cancer? Every 76 minutes someone will die from the disease. Team in Training Canada is a worthy initiative that benefits both the individual with their fitness training and support and society by funding lifesaving cancer research. In North America, they have raised $1.2 billion already! I encourage you to check out Team in Training Canada if you are a runner or hiker or have the desire to become one! Getting fit and supporting a good cause sounds like a win-win situation to me. Excited for this party! So good to be active – and TNT and their team are doing great things! Love to learn more about them. Looking forward to this Twitter party and learning about running and hiking. Just started running and looking for a group, so most excited about this Twitter Party!